I am excited to join the No-Sew Showcase gang this month to bring you some last minute ideas for Easter! I am sharing my super-easy no-sew egg cozies. They will add a festive touch to your Easter table to keep those eggs warm or simply serve as a little gift for your guests. And…the good news is that you don't have to sew a single stitch to create them! Aren’t they cute? I couldn’t believe how easy they were to make…just a few minutes for each one! Here is the template for the bunny cozy. I was inspired by the one that I found here, but it didn’t fit over my egg cups. I had to make some adjustments and you may find that you have to do that, too. I printed it at 5x7 size using Photoscape, a free download, since I can easily control the size of my print-outs. Double the felt, pin the pattern and cut out the pieces. Run a small, thin bead of hot glue along the edge of the pattern, leaving the bottom open. Before the glue has had a chance to cool, carefully put the top piece in place over it. (Be careful...you don't want to get burned...yikes!) There’s not much room for error, so be sure you have it where you want it. Hint: Don’t go all the way to the edge with the glue to allow for it to spread a little. Don’t press too hard or it will show through. Tie a length of ribbon around the bunny’s neck. You may add a small drop of hot glue under the knot to hold it in place. Then, using tin snips, cut the back tabs off of the brad and secure the little remaining button to the bunny as the eye with a small drop of hot glue. Turn the bunny over, add a small drop of hot glue to the bottom center and position the tail. And…taaa daaa!…here he is! Isn’t he cute? I love the little festive touch that he adds to the table! They will be a fun surprise for my guests at Easter brunch…and they may take them home with them, too! And here’s how it looks from the back…love it! I think this is the cutest, easiest and least expensive bang for my buck that I have ever gotten! The felt was only 29 cents for each cozy and I already had everything else. Our CEO Miss Ozzie is not much impressed, however. She would rather enjoy the afternoon sun. It’s not a real bunny after all, she says. So what’s the big deal? …he reminds me of a Peeps bunny. In fact, they all remind me of the Peeps Mason jar candle that I made last year! 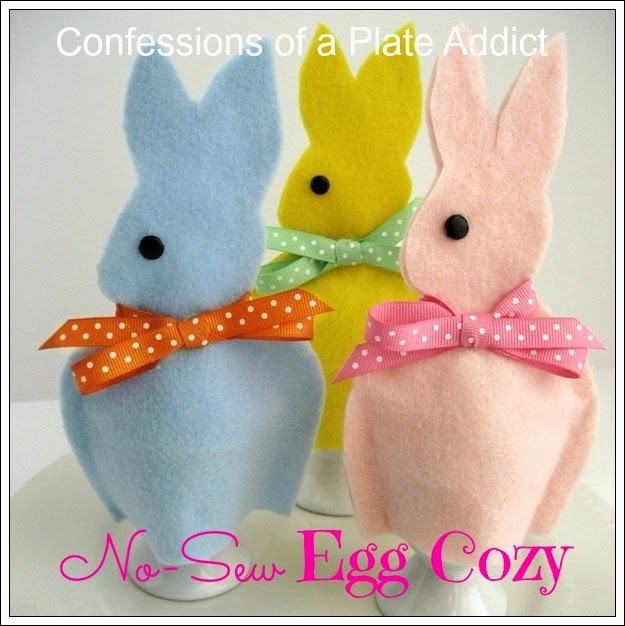 …and, of course, my no-sew egg cozies! 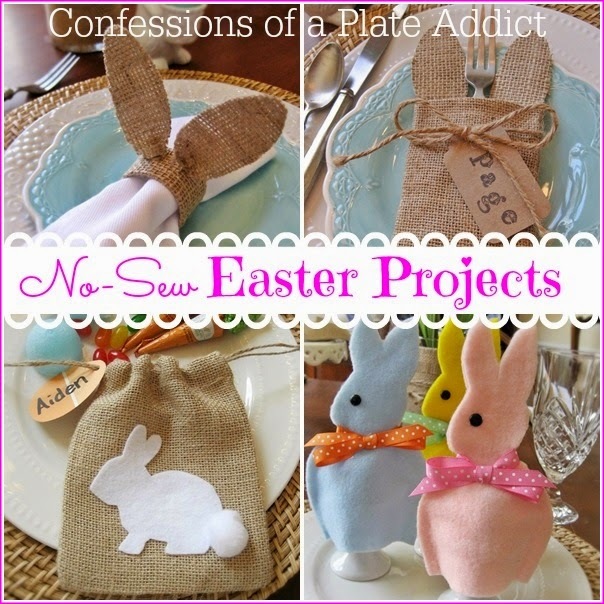 Be sure to head over to visit the rest of the no-sew gang to see the easy, last minute ideas they have for Easter! Thanks for stopping by! I hope you enjoyed my easy no-sew egg cozy! Please visit these wonderful bloggers and their beautiful blogs to see what they are up to and to find a list of this week’s participants! This is just so so cute, Debbie! What a fun project!!! Love doing the NO SEW with you! Your egg cozies are so cute. Peter and his cuzzies are too adorable, Debbie! I'm with Amy - I think my fave part is that cute little tail. I love easy and affordable projects and these sure do fit the bill. I've really been enjoying our no-sew showcases each month! Cute, cute! Love the colors you chose, and the dotted ribbon bows. Happy Easter! Debbie: Those egg cozies are the cutest ones I have EVER seen! You have the best projects and your blog has got to be my "all-time favorite." I wish I had your talent...if you check my blog, theoldefarmhouse.blogspot.com you will see why I can't even begin thinking about crafts right now but you are truly an inspiration to me. I want to do ALL of your ideas but they will have to wait till I get more settled (and fix a place to do them.) LOL Thank you for sharing your talents. Such a cute idea for people like me who can't sew a stitch and whose best friend is a hot glue gun!!! Right on tie for Easter! The colors you chose are really neat, too. I can't even pick a favorite! Have a very Happy Easter!! !